Met with Dr. I. Nyamongo (Director) and Prof. S. Wandibba, at the Institute of African Studies, University of Nairobi, and discussed further cooperation and joint researches. Met with Dr. Richard Bagine (Deputy Director for Research and Development, Kenya Wildlife Service) and Mr. Hiroshi Imae (JICA expert: Wildlife conservation education advisor), and discussed the field research plan of Mr. Charles Mutua (ASAFAS graduate student, year of enrollment: 2004). Held a student seminar at the Kenya Field Station, and had discussions with Dr. Shun Sato (TsukubaUniversity), Dr. Koji Kitamura and Ms. Kanako Miyake (OkayamaUniversity), and Dr. Shinsuke Sakumichi (HirosakiUniversity). Conducted on-site education in Nyeri and Laikipia Districts in central Kenya: I made an extensive survey together with Mr. Mutua who was to conduct field research on human-wildlife conflicts. Conducted field research on social changes among pastoral peoples in northern Kenya, especially in the Turkana District. Visited the Institute of African Studies, University of Nairobi, and the Headquarter of the Kenya Wildlife Service, to collect research materials. The Kenya Field Station (Kenya FS) was established in June 2003 in a borrowed flat in Nairobi, to facilitate on-site education and field research, as well as to strengthen cooperation with Kenyan educational and research institutions. However, because we cannot afford to station researchers permanently at the Kenya FS, teachers and graduate students who utilize the FS are supposed to do such miscellaneous jobs as house cleaning, payment of rent, payment of electricity and telephone bills, and maintenance of computers. When I arrived at the Kenya FS this time, I found that the telephone service had been cut. We had acquired the line in August 2003 to get an ISDN connection from an Internet service provider, but had not paid any fees since then, because we have not received bills. I went to the office of Telcom Kenya (a telephone company) for three consecutive days and found out that they had never issued bills to us, and that they have lost the documents showing that we had purchased the line. I showed them the receipt for the line, and insisted that it was their fault (not ours) that no payment has been made. At the end, the line was revived, but we have not paid anything yet at all (by December 2004), because Telcom Kenya has yet to issue any bills. In conducting research in African countries, one has to put up with lots of things like this. I strongly felt that we need somebody to be stationed at the Kenya FS permanently. While I was in Nairobi, we held a student seminar, with a presentation by Mr. Charles Mutua (ASAFAS graduate student). Dr. Shun Sato (TsukubaUniversity), Dr. Koji Kitamura (OkayamaUniversity), Ms. Kanako Miyake (OkayamaUniversity), and Dr. Shinsuke Sakumichi (HirosakiUniversity) attended the seminar and gave fruitful comments (Photo 1). Dr. Isaac Nyamongo, the Director of the Institute of African Studies, University of Nairobi, and Mr. Fred Ikanda, who recently obtained his Master Degree at the Institute, also visited the Kenya FS. Mr. Charles Mutua came to Kyoto last April and joined our GraduateSchool beginning in the third year. He obtained his Master Degree in Kenya, and has worked at KWS (Kenya Wildlife Service) for about ten years. His research topic is human-wildlife conflicts, in particular focusing on the conservation of elephants. Kenya is famous for its rich wildlife, and tourism is one of the most important means for acquiring foreign exchange. KWS is a governmental organization responsible for wildlife conservation and the management of national parks and game reserves. Mr. Mutua, as a staff member of KWS, has taken part in the planning and implementation of conservation and extension projects. He came to Japan as a long-term JICA trainee to conduct research on human-wildlife conflicts. One of the main purposes of my visit was to conduct a preliminary survey in Nyeri District, where human-wildlife conflicts are very intense.In particular, the seasonal migration of elephant herds causes a lot of problems. Mr. Mutua and I conducted an extensive ten-day survey to find a specific focus for the research, and to determine the villages where he can make intensive research. In the course of this trip, I realized that this is a very interesting area for investigating the topic of human-wildlife conflicts. A brief outline is provided below. Nyeri District is located in central Kenya. 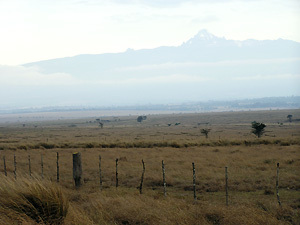 In the east, Mount Kenya, the country’s highest mountain, rises into the sky, and the Abadere Highlands spread out to the west of the Districts. Both of these areas are rich in wildlife. The distance between these two mountains is about 100 km, and the elephant herds that migrate between them seasonally cause a lot of problems to humans, destroying crops and human settlements (Photo 2). Ecologically, the northern part of the District, in which Mr. Mutua will carry out his research, is a transitional zone between a humid zone with rich precipitation and arid savanna. Various crops are produced in the former area, and the latter is utilized for raising cattle, goats and sheep. In colonial times, there were many large farms owned by Europeans in these areas. After Independence, most of them were bought by the government and given to small-scale farmers. However, in the northern part of the District, which is not suitable for farming, large-scale farms remain intact, and are utilized for livestock production today (Photo 3). Some of these farms also engage in building facilities for tourists, and for these farms the migrating elephants are favorable. Large-scale farms, which the government bought after Independence, were divided up and sold to small-scale farmers in the 1970s and 1980s, but some people bought the land only as investments. These farms remain uncultivated and provide wild animals with suitable grazing land. Some of these absentee owners plan to utilize their farms for tourism, following the example of the owners of large ranches. In short, there are three types of actors: (1) small-scale farmers who suffer from the invasion of wildlife, especially elephants, (2) absentee owners who do not mind the presence of wildlife, and (3) people who are trying to do business in tourism, utilizing wildlife. There is a clash of interests among them. This problem is caused not only by ecological factors, but also involves historical and political factors. It will be very interesting and fruitful to disentangle these factors, and I look forward to the progress of Mr. Mutua’s research. Photo 1: At the Kenya FS. 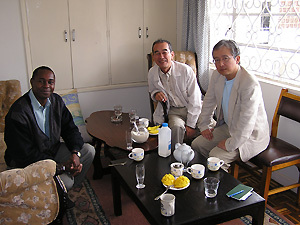 From the left, Mr. Muta, Dr. Kitamura and Dr. Sakumichi. 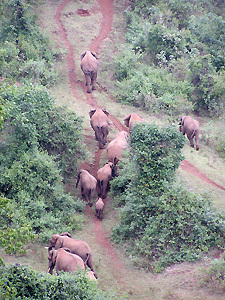 Photo 2: Migrating elephants in the Abadere Mountains. Photo 3: Mt. Kenya rises into the sky behind large-scale ranches.